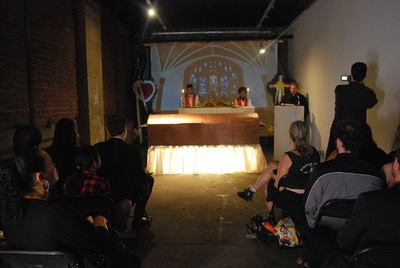 My Grandfather’s Funeral was performed at English Kills Gallery on August 29th and 30th, 2009 with a cast of clergy, soldiers and family members. 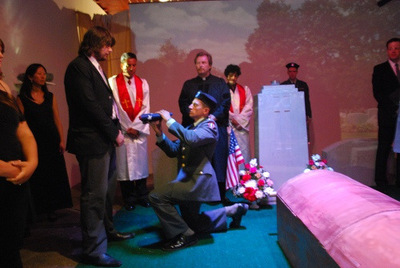 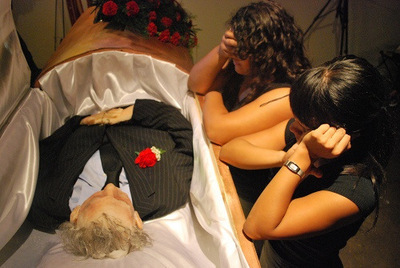 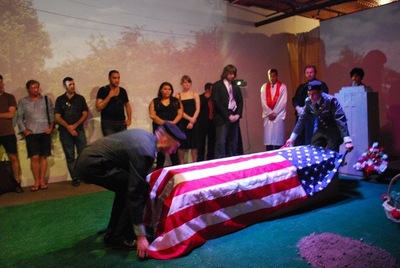 In this piece, I created a re-enactment of my grandfather, Chickie Kotak’s 2005 funeral in Norwood, MA. 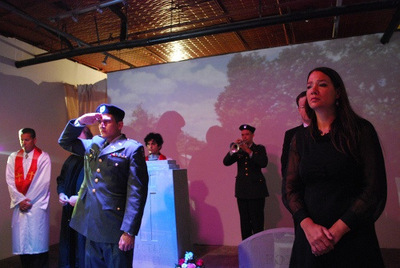 The piece involved three acts – The Wake, The Funeral and Burial Rites – and approximately 20 performers. 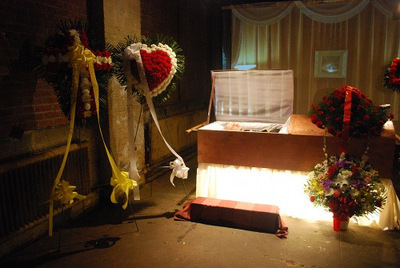 In the Wake, an installation was set up in the front room of the gallery to mimick the Kraw Kornack funeral home where my grandfather’s funeral was originally held. 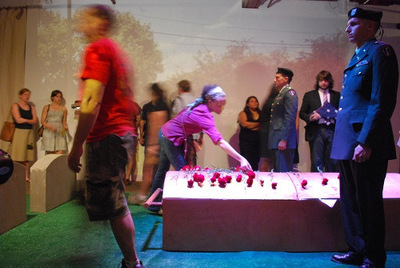 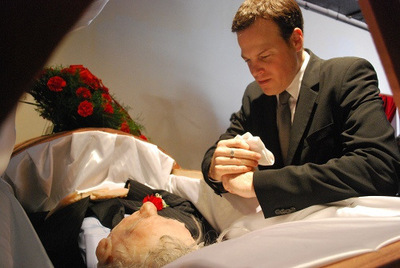 Upon entering the space, visitors would see a guest book, photo collage of my Grandfather’s life, projections of the interior of the funeral home, large arrangements of flowers, a replica of my grandfather’s coffin and wax sculpture of my grandfather’s corpse. 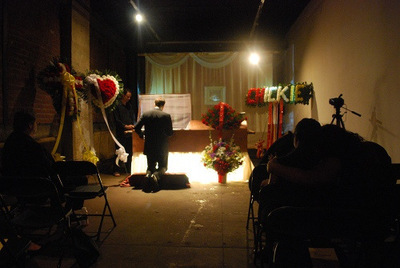 Audience members became attendees of the wake and were invited to sign the guest book, kneel by the coffin to pay their respects to my grandfather’s remains and offer their condolences to myself and other grieving family members played by Philipp Gutbrod (my father), Peter Dobill (my cousin Jonathan), Elizabeth Vega, Justine Pagan, Dayan Salamanca, Xavier Hernandez, Joshua Holtsford and Alice Cox. 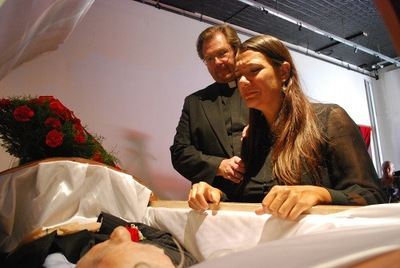 For the Funeral, the front of the gallery was installed to appear like the inside of St. Catherine’s cathedral in Norwood, MA where my grandfather’s original funeral took place, with images of the interior of the church projected onto the walls and altar. 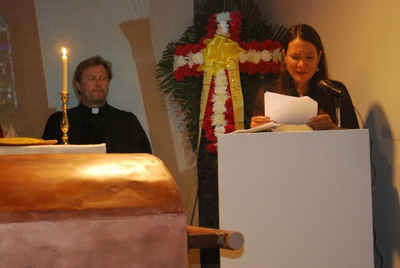 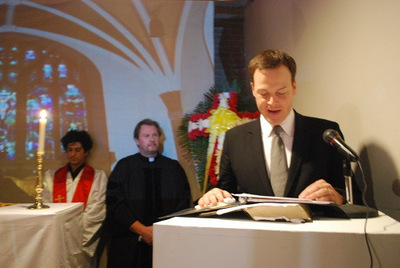 During the service, I and my performers re-enacted the actual funeral service where the priest(Jeff Horn) delivered the sermon, the Cantor (Andrew Hurst) lead the congregation in singing “Amazing Grace”, I shared a bereavement poem, and my father (Philipp Gutbrod) read the original eulogy. 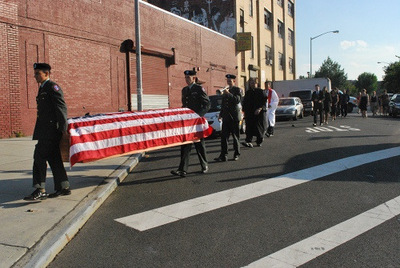 As my grandfather was a veteran of WW II, at the end of the service, soldiers (Michael Martarano and Barry Halpert) came in to perform the military rites, saluting the coffin and covering it with the American flag. 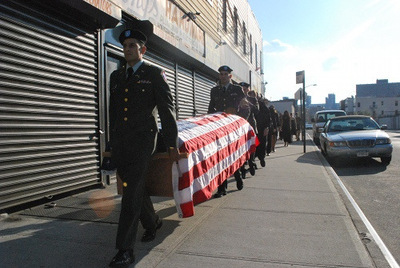 The soldiers then carried the coffin out of the gallery and lead a funeral procession along the neighboring streets. 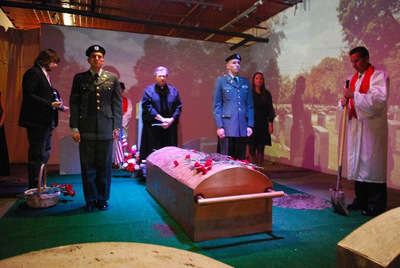 The clergy, family members, and audience members followed in sync while a soldier trumpeter (Christopher Flannery-McCoy) played military bugle calls. 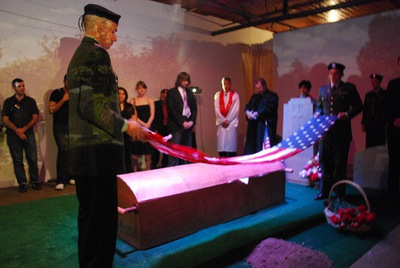 For the Burial Rites, the soldiers carried the coffin into the back room of the gallery where the space was installed to appear like the Highland Cemetery in Norwood, MA in which my grandfather was buried. 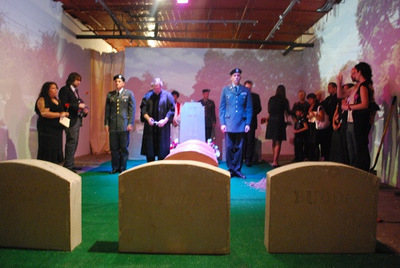 In the center of the space was an exact replica of my grandfather’s tombstone, surrounded by re-creations of other gravestones. 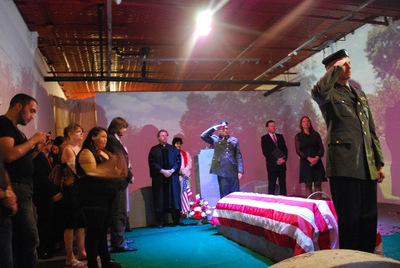 Projected onto the walls of the space were surround images of gravestones stretching off into the distance, taken around my grandfather’s tombstone at Highland Cemetery. 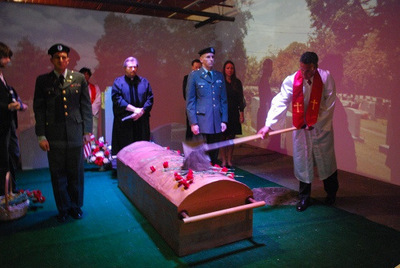 The soldiers placed the coffin in front of my grandfather’s tombstone, and the clergy and family members gathered about. 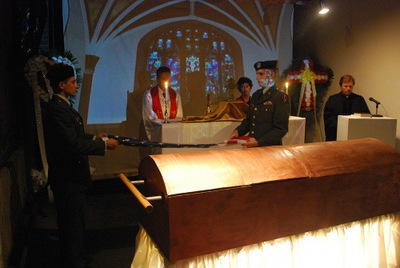 The soldier trumpeter played taps, and then the other two soldiers performed the rites of folding the flag and presenting it to my cousin (Peter Dobill). 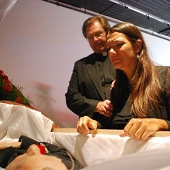 I handed out red carnations to all of the family and audience members to place on the coffin, and the priest delivered the final prayers.